Some might consider it overkill, but this massively modulatable delay is a sound designer's dream come true. Versatile routing of FX chain. Allows creative, unique delay effects. Powerful TransMod modulation system. Tape delay 'ageing' control sounds great. Can't unlink EQs' frequencies. Envelope follower lacks sidechain. Fundamentally, Bloom (VST/AU/RTAS) is a delay unit with the usual time and feedback controls, quickly and easily providing you with usable echoes. More importantly, though, it has real complexity and depth in place for us geeks, bringing with it endless potential for unconventional creativity. You'd expect nothing less from FXpansion, to be fair. "At Bloom's heart are three stereo delay models: tape, analogue and digital"
At Bloom's heart are three stereo delay models: tape, analogue and digital, each with its own further 'refinement' control. In Tape mode, you can adjust the age of the tape, affecting hiss, wow and flutter levels, as well as dullness. The analogue model is called BBD, which stands for Bucket Brigade Delay, referring to the analogue circuitry involved and here emulated. Its refinement knob controls the number of 'stages' - simply put, the lower the setting, the more lo-fi it becomes. Finally, the Digital model's Era knob sets the bit depth, from crunchy 'vintage' 8-bit all the way up to pristine 24-bit quality. The Slew knob affects how smoothly Bloom handles changes of delay time, enabling convincing tape-slowing effects as opposed to sudden judders. The other delay controls are relatively conventional: Delay time (set synced or in milliseconds), Feedback, input and output gains, Mix, and Pan. You can reverse the delayed signal, freeze it as a loop, and use the ping-pong setting to send the delay back and forth between the two channels. With the simple stuff out of the way, then, let's get to the meat. First, we have an effects chain consisting of a fixed effects block, an EQ and low/high-pass filters (in that order) that can be inserted before, in or after the feedback circuit. Put them directly in the feedback loop for ever-deepening dub effects, for instance. "As we've come to expect from FXpansion, the sound quality is first-rate too"
The effects block comprises an Envelope Shaper (for softening or hardening the attack), a Frequency Shifter (for cranking your sounds' harmonics up or down), Chorus, and Drive. 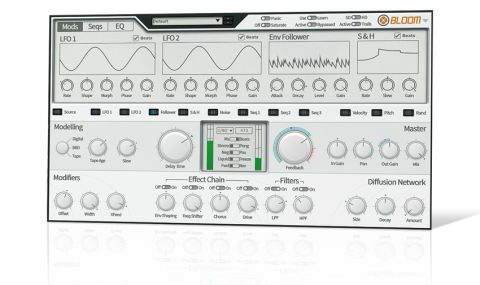 We particularly like the Frequency Shifter, which can generate some good rising feedback effects. There are two 3-band EQs built in, too: one in the effects chain and one at the output. Both share the same centre frequency and Mid Q settings, which may seem strange but is actually thus so that you can counterbalance extreme boosts in the effects EQ using corresponding cuts in the output EQ. The Modifiers section enables stereo adjustments. The Offset control slightly varies the left and right delay times, giving a broader picture; Width lets you narrow the stereo field, which is particularly useful for ping-pong delays; and XFeed routes the left and right channels' feedback into each other somewhat. Finally, Bloom's Diffusion Network is a low-key reverb, which, unlike the built-in spring reverbs of a Roland Space Echo, for example, doesn't carry much in the way of sonic charm. It's useful for smearing the delay feedback, though. Where Bloom really opens up is in its modulation facilities. It's a great plugin, doing the simple things quickly and effectively and providing the tools to facilitate some extremely weird and wonderful stuff once you get your head around it. As we've come to expect from FXpansion, the sound quality is first-rate too. The cross- modulation proves the key to unlocking its creative power, while the effects chain and EQ within the feedback loop make it a dub-tastic addition to any producer's arsenal.